This recipe is for a portion for 1 person, I suggest just using it as a guide. You can add as much or as little of the ingredients as you like. Chop the onion into dices and fry on a medium heat with a spray of the low calorie cooking spray until soft and translucent (usually around 8 minutes). Chop the red pepper into slices and add to the onion with cayenne pepper and paprika and fry for another 3-4 minutes. Add the chopped tomatoes and mix with the onion and pepper for another few minutes then add salt and black pepper to taste. Now make a well in the middle of the tomato, crack in the egg and cover, leave the egg to poach (which should only take around 4 minutes for a runny yolk). Whilst the egg is poaching you can make the guacamole. Mash up the avocado, chop the red chilli into thin slices and finely chop half the coriander (including the stalks) and add to the mashed avocado. Squeeze in the lime juice and mix is all together and thats the guacamole done. Roughly chop the rest of the coriander and sprinkle over the Huevos Rancheros and add a good scoop of guacamole. You can either serve it in the pan or dish it up onto a plate. This is a delicious and filling breakfast that can really set you up for the day and at only 235 calories it is super healthy too. 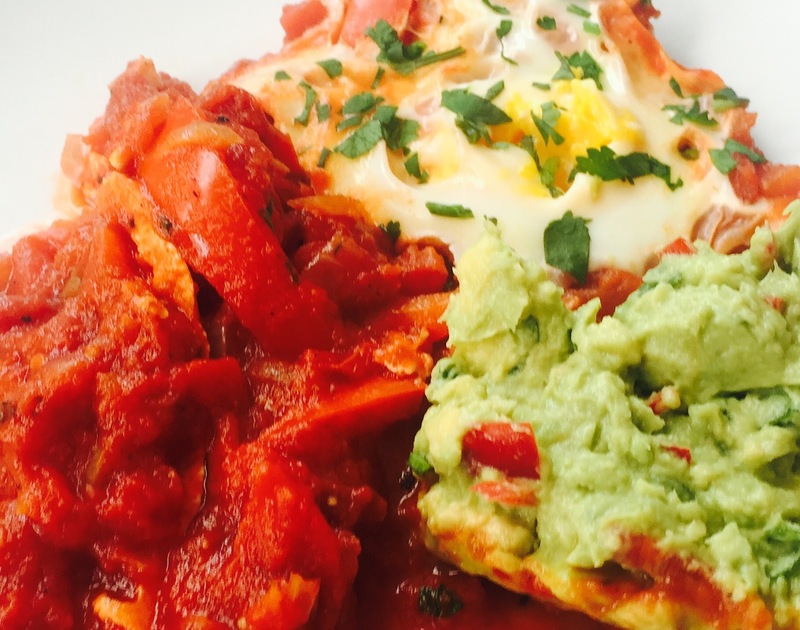 Eggs poached in tomato is my favourite low cal breakfast but I think I like the sound of spicing it up a bit! I know and if you lose the guacamole its 85 calories less!